This modern French tapestry "Grand Tulip" shows a glorious close up of a tulip in full bloom. Filled with impeccable detail, this piece shows all the parts of the tulip flower, in this case a gorgeous striped tulips in white and crimson, rendered beautifully. The work takes the traditional floral subject of still life art and creates a modern and contemporary work that has a rich color palette and beautiful design. 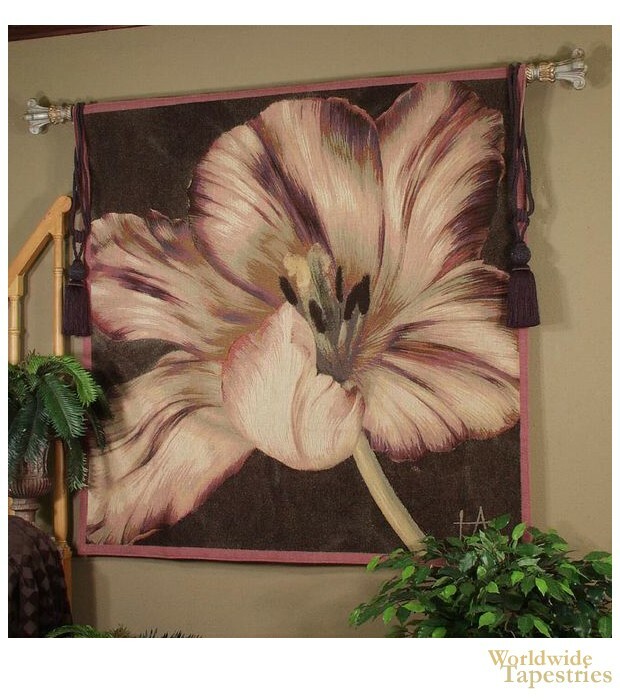 Full of beauty, this French floral tapestry "Grand Tulip" is backed with a lining and has a tunnel for easy hanging. Note: tapestry rod and tassels, where pictured, are not included in the price.